Whose line is it anyways? Campbell returns, Ferlin becomes healthy scratch. The Boston Bruins had a successful two-day weekend home stand as they defeated Philly in a thrilling 3-2 OT comeback win Saturday. Less then twenty-four hours later Boston defeated Detroit 5-3. During the weekend Boston welcomed back 4th line center Gregory Campbell back to the lineup, as rookie call up Brain Ferlin was made the healthy scratch. This weekend allowed Boston to extend their lead on 9th place Florida by four points, and 10th place Ottawa by five points. Boston heads to Ottawa for a game against the Senators on Tuesday. Philadelphia desperately needed a win against Boston on Saturday but was unable to do so, and then lost to New Jersey the following day to drop seven points back of Boston, and now sits in 11th. Campbell's return to the Bruins lineup allowed for Boston's projected fourth line to make its debut since the Max Talbot trade. The line featured Daniel Paille on the LW, Campbell at his usual center position, and Boston’s newest piece Max Talbot on the RW. On Saturday, Campbell made a crucial mistake by icing the puck before hitting the red line, which then resulted in Philadelphia’s Chris VandeVelde tipping in a Nick Schultz shot to put the Flyers up 2-1. Campbell however didn’t let this discourage him in his first game back since his upper-body injury. The Bruins fourth line got a second chance after this mental mistake from Campbell, and was able to draw a penalty against the Flyers, which put the Bruins on the PP with 2:03 remaining. Boston would pull Tukka Rask putting them 6 on 4. Brad Marchand would extend the game to OT with a tip in off a Dougie Hamilton wrist shot. Marchand would go on to win the game for the Bruins in the extra frame. 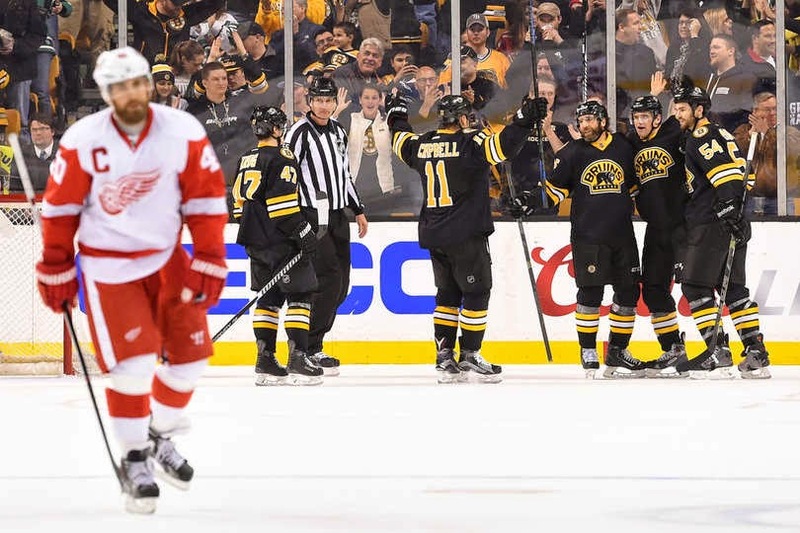 In Gregory Campbell’s second game Sunday against the Detroit Red Wings, the fourth line was back in full-force as Daniel Paille scored twice including a goal that contributed from both Campbell, and Max Talbot. With Campbell back on the fourth line playing alongside two veterans the line seems to be gelling well, and bringing back the old-school grinding mentality we are all so use to seeing from a Boston fourth line. While Gregory Campbell was out Boston called up Brain Ferlin from Providence. In his six games played with Campbell he brought more offensive skills to the fourth line as he played alongside Chris Kelly, and Max Talbot. Daniel Paille was moved up to the third to play with Carl Soderberg, and Loui Eriksson. During Ferlin’s short stint in the lineup he contributed one assist, and a plus/minus of -1. That was the big concern with Ferlin’s game was his defensive zone ability to break the puck out. As a firm believer in experience, and knowing how to handle high-pressure situations, Boston is making the right choice by allowing Campbell back in his primary role of fourth line center. Brain Ferlin certainly showed flashes of his offensive ability as he created plenty of scoring chances for the fourth line, and his potential to be a solid role-player at the NHL level. At this point in the season however Boston cannot afford any mistakes in their own zone, and with Campbell returning it brings a more defensive minded forward to the lineup. With the playoffs only weeks away, it looks pretty clear who the odd man out will be for the final spot at the forward position, and that player would be Brain Ferlin who is only 22, and a rookie. Gregory Campbell brings another veteran to the lineup that has played in critical situations during his career, and brings another solid center to the lineup. Campbell has won 54% face-offs this year for Boston. With the final wild-card spot in the air still, Boston will rely on its veteran leadership, and defensive brand of hockey to get them their. While Ferlin is a young player that will eventually find his way into the Bruins lineup, Boston needs Campbell to center that fourth line, and use his experience and leadership to their advantage as the Bruins know there is a lot on the line as they come down the final stretch.